According to Statistics Finland's preliminary data, the volume of Finland’s gross domestic product increased 1) in July to September by 0.4 per cent from the previous quarter. Compared with the third quarter of 2016, GDP adjusted for working days grew by 3.0 per cent. Revisions put the change in the volume of GDP in the second quarter of 2017 at 0.8 per cent from the previous quarter (was 0.4%) and at 3.6 per cent from twelve months back (was 3.0%). In the third quarter of 2017, the volume of exports decreased from April to June by two per cent but increased by six per cent from one year ago. Imports decreased by 2.5 per cent from the previous quarter but increased by 0.5 per cent year-on-year. Gross fixed capital formation, or investments, grew in July to September by two per cent from the previous quarter and by nine per cent year-on-year. The volume of private consumption grew by one-half of a per cent from the previous quarter and by two per cent from twelve months back. 1) Volume refers to data from which the effects of price changes have been eliminated. Volumes at reference year 2010 prices are expressed relative to the 2010 level at current prices (in EUR). 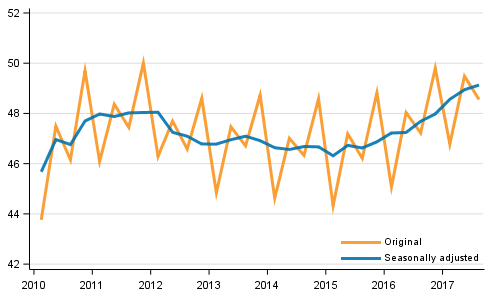 Change percentages from the quarter of the previous year have been calculated from time series adjusted for working days, and change percentages from the previous quarter from seasonally adjusted time series. ISSN=1797-9765. 3rd quarter 2017. Helsinki: Statistics Finland [referred: 25.4.2019].